10 years in business and 10 years of marriage had to be celebrated some way, so we packed our bags last week and took a quick busman’s holiday tour of the Big Apple! 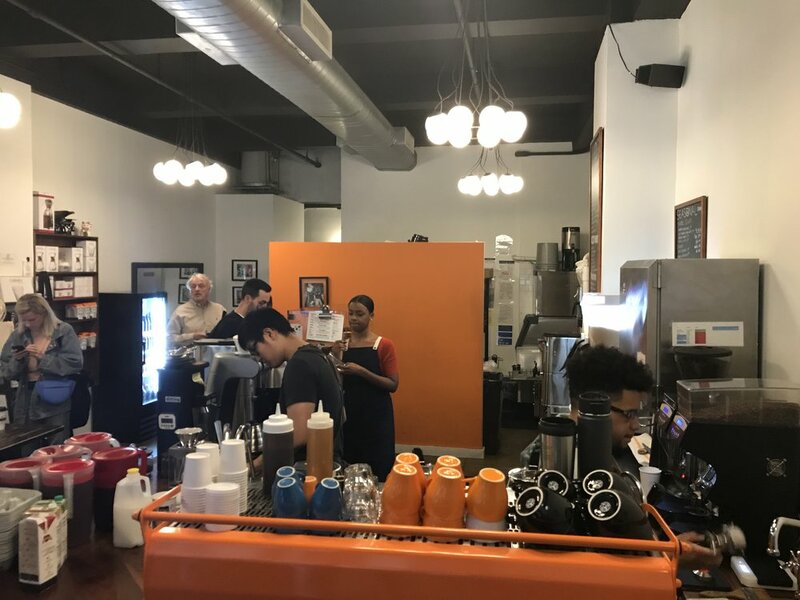 Our visit focused solely on the Manhattan area (newbie tourists and all that, so had to be the prime focus on the first visit), however we heard amazing stories from those in the know that the Brooklyn scene is really kicking off. 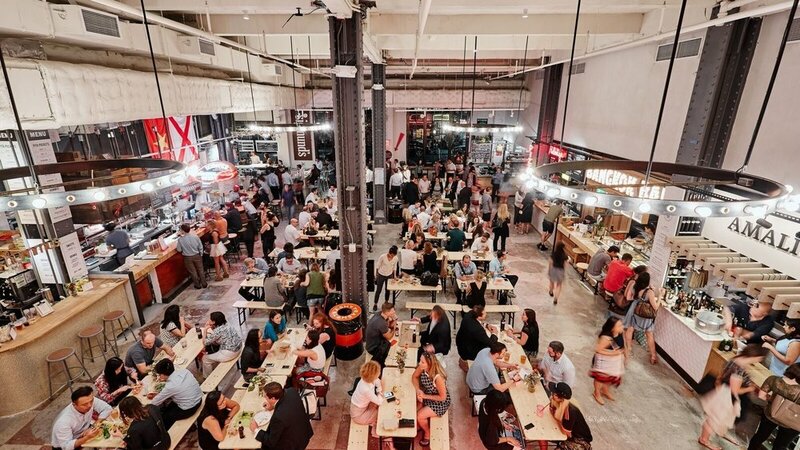 If you are booking a trip, it seems you really need to fit in some time to cross the Brooklyn Bridge and spend some time there to check out the booming artisanal food scene. Times Square is about as central a location as you’re going to get in order to get around. Regardless of where you stay in New York you won’t be getting a big room, however you do want comfort and a nice modern feel, without spending a clean fortune. This being the case we can strongly recommend Row in Times Square as our hotel of choice. Nice friendly staff, loads of choices for eating (if you don’t want to venture too far when you immediately arrive) and good views if you get a room at the front of the hotel. Our one thing to note is that some rooms are close to the elevator shafts and can be noisy! This happened to us on the first night. We asked to move and they were more than happy to do so (with a cheeky upgrade to boot)! Those of us who have tuned in to Netflix and binged on foodie based documentaries will no doubt have come across David Chang’s amazing series “Ugly Delicious.” One of the themes that comes across in these documentaries is David’s love of flavour and this one (of his 15 restaurants) is a fabulous example of no fuss and maximum flavour. In this particular restaurant you can’t book in advance. This is reflective of it’s relaxed and modern theme with an open kitchen and PLENTY of noise and atmosphere. Mid week we waited just 15 minutes to get a table (which was on the kitchen pass)! and the bill came to around $100 including tip (2 courses and a couple of (very good) beers)! Expect strong Korean influences and a heap load of delicious Ramen bowls!! 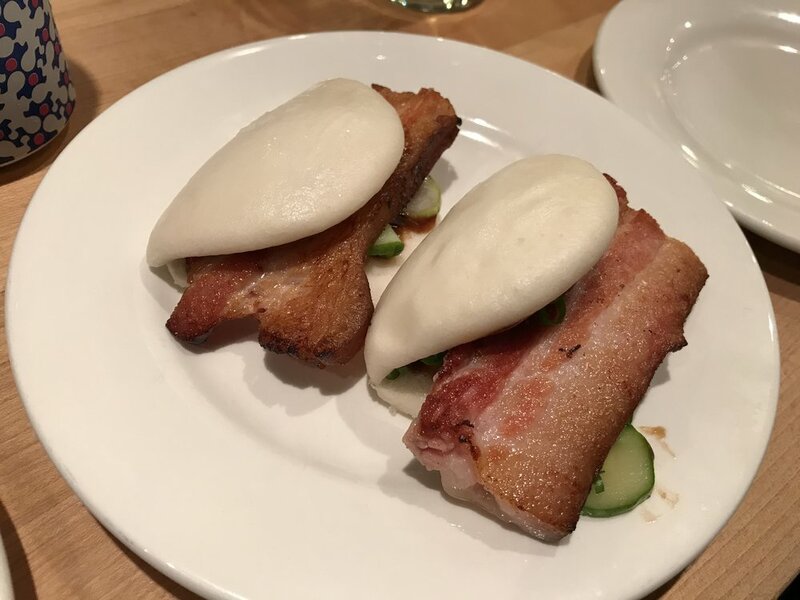 Pork Bao Buns (yup - as tasty as they look)! Located at 275 Mulberry Street in the cool student area of lower Manhattan. Rather than a permanent chef and cuisine, Chef’s Club hosts award winning chefs on a temporary residency basis (even changing the decor to suit the cuisine in question). During our visit, Chef’s Club welcomed Abraham Conlon of cult restaurant Fat Rice in Chicago. Abraham is a James Beard Award-winning chef who draws on the cuisine of Macau, with a menu rooted in the culinary traditions of Portugal and China but exploring ideas, inspiration, and ingredients from all along the historic Portuguese spice trade routes. 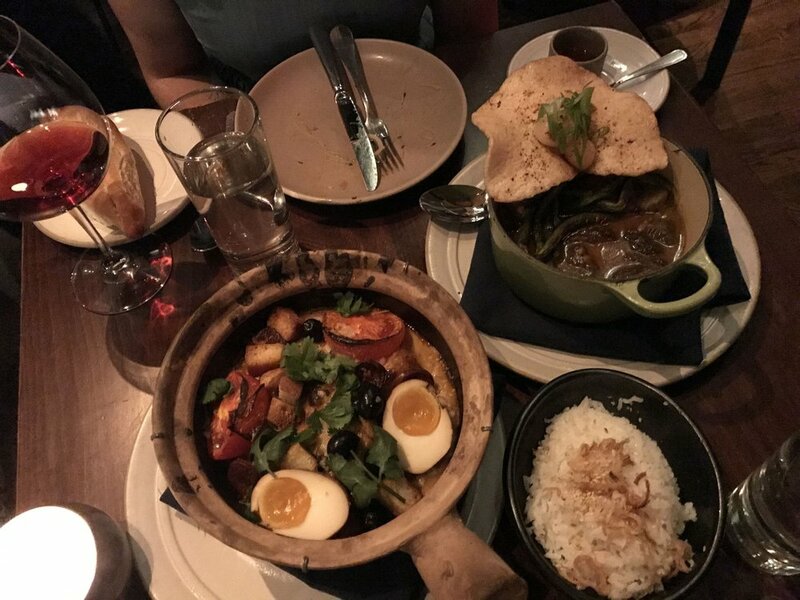 The menu was rich and varied with plenty of choice and only one of our dishes got photographed (we were too keen to get tucked in)! A real surprise - an affordable Nebbiolo from Santa Maria Valley that tastes like a decent Barolo!! Founded by James Freeman in San Francisco in 2002 this top chain of outlets retains their 3rd wave quality and feel despite selling out in a multi million dollar deal to Nestle in 2017. For those interested in coffee brewing and cakes, James and his wife also co-authored a cracking book entitled “The Blue Bottle Craft of Coffee.” James writes the first half of the book on coffee, his wife the second half on bakes. Forgo the espresso based drinks and have a Single Origin Pourover Coffee - their speciality. They roast their own coffee out in Brooklyn and despite it being brewed a little stronger than I like (a higher dose of coffee to water ratio than I’d choose), when we took a bag home, the coffee was delicious. A very unique coffee for those coffee geeks out there. A Kenyan (not of it’s itself unique, but a naturally processed one which is rare to find). Expensive at $20 a bag, but an incredibly complex and clean cup. Cafe Grumpy on our first visit (the not-grumpy time)!! 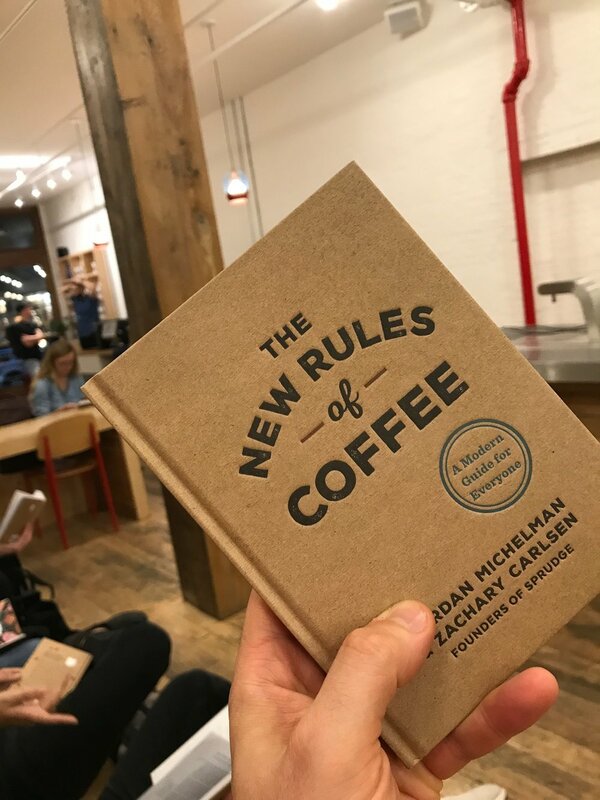 We were extremely excited to go here as it was for the launch of online coffee blog “Sprudge”’s new book for “The New Rules of Coffee.” (a signed copy of which is now in the cafe library if you’d like to read when your’e next in)! The training space itself is something to behold with equipment that would blow any coffee aficionado’s mind and expert trainer’s to match. Admittedly post 7pm coffee drinking wasn’t the best idea in the world, but then a few drinks helped with the zzz’s later on!!! drink in NYC’s oldest pub (McSorley’s Old Ale House) - serve only 2 drinks - pale and dark ale… seriously!! If you’d like any more info, just drop us a line and we’re happy to share!